It all began on Wednesday 21st September. We arrived in our tracksuits, and began to drag our cases, which contained everything but the kitchen sink, to the PE hall. From there, many of us set off to buy out SuperValu. After ambushing the cashiers with a combination of milk, tea bags and pot noodles, we came back with the innocent but misguided intentions of trying to fit them into our already packed cases. We were then bundled out on to the bus with the already- exhausted teachers hot on our heels. Unfortunately, we had to begin our journey without Vinny to guide us along the way. We soon reached the land of the sheep, which came as a shock to many of us city girls. What with the abundance of potholes, the constant maa-ing of sheep and the forests galore, we knew we had arrived in a far distant land. It was outside in the wind that the instructor broke the news to us that we were being sent out into the Wiley woods of Kippure. When he said the words Masterchef and Bear Grylls in the same sentence, about 50% of our group began contemplating how long it would take to return to the bus. Reality hit like a tonne of bricks the moment that the box-fresh white superstars were playing hide and seek in the mud. After being split into teams, we were given the tasks of finding food, building a shelter, starting a fire and cooking the food. The alarm bells went off once we were told about the cooking part! The majority of us could just about manage the culinary skills required to whip up pot noodle. Armed with logs, a map, a gallon of water and a frying pan, we were left to our own devices. 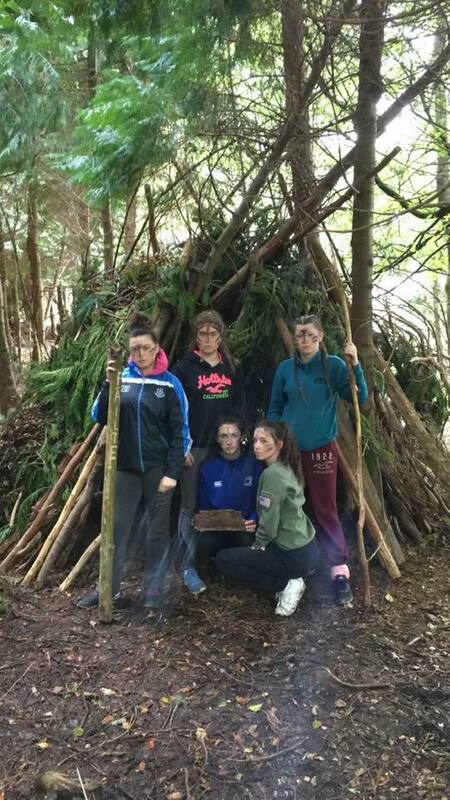 We seriously surprised ourselves when we managed to build a shelter fit for a king and to get the fire going. Another great feat we overcame was the cooking aspect of bushcraft. We successfully cooked a hearty meal of rashers, sausages and vegetable stirfry without poisoning any of our instructors. Bushcraft was definitely a highlight of the trip- despite the fact that we were knee deep in marsh! Next we hopped, skipped and jumped over to the climbing wall. The activity allowed those of us who fancy ourselves to be mountain goats to shine out from the crowd. We scurried our way up the wall and abseiled smoothly back down. How easy could it get?! Amongst many other activities, archery included, our next stop was ziplining. We harnessed ourselves in. And enjoyed the movement of the zip line through the trees as we screamed in excitement, like Tarzans in the jungle. 'Twas great craic altogether! Next, we hopped on a bus to the Blessington Lakes for a unique kayaking experience! After climbing into our wet suits and pairing up, we gritted our teeth and made our way into the bitter cold water, kayak in tow. Mr Brennan and Ms Davey joined us as we tried our hand at the water sport. Much to our surprise, we managed to actually stay in the kayaks for the most part! But of course, Mr Brennan was on hand to overturn the boats so we wouldn't miss out on the full Blessington lake experience (and getting pneumonia!) Kayaking was one of the favourite activities amongst the different groups. Despite the freezing cold, wet hair and running tan, we had such good craic in the kayaks! Even the people who were afraid of water gave it a go and ended up loving it! We welcomed night time orienteering with open arms, thinking it would be fairly tame compared to the rock climbing and kayaking. Boy were we wrong. A map was placed in front of our very eyes and we were sent off into the woods. Without a clue about how to read the gobbledygook in front of us. JC Geography didn't help. We squelched through mud, marvelling at the thought of being independent women, wandering around the forest after all hours. We squinted in the pitch black, scribbling down clues we found along the way. Although rain pelted down on us, we remained determined and continued to trudge through puddles of country land. Eventually we made our way back, only to find out that we had to construct a rocket in 10 minutes. Disc golf was a marvellous addition to the trip. In our group, we sauntered down the road, only to be greeted by a looming mountainous hill. The fondness left our eyes when we realised we had to climb this hill like mountain goats. Disc golf involved flinging a frisbee in the general direction of a basket, and continuing to hurl it towards the basket until finally we hit the jackpot. However, only approx. 4 out of 53 of us actually participated in this activity. Many of us thrust our phones into the trusted hands of our friends, demanding them to capture a tumblr- style picture of us looking off into the distant lands, to be put up on the insta upon the discovery of a bit of wifi. After dinner was served to us in silver platters on the final night, the teachers sat us down and broke the news that we were going to have to write and perform a play. Immediately our reaction was to go into hiding in the dark woods, but we stuck it out. Within a short 40 minute brainstorming session in our houses with a table full of sweets and a few arguments, we had written plays worthy of Broadway (at least we thought so). With feigned confidence, we performed our plays under the scrutiny of Mr Brennan, Mr Daly, Mrs O'Reilly, Ms Davey, Ms Magliocco and Ms Ferris. Even though our plays were all one-of-a-kind, only one house could go home with the life changing prize of €20. After the winners had received their 'Apache money', we trudged back to the houses in a state of exhaustion. All that flinging of cauliflower props and what not had exhausted us to the point where not one of us wasn't feeling sympathetic for ourselves.We woke up the next morning, 99% of us after catching the beloved cold. We coughed and sniffed the whole way home, finally arriving back home at 3:30pm. We hopped off the bus with tears in our eyes as we realised that Kippure was no more. 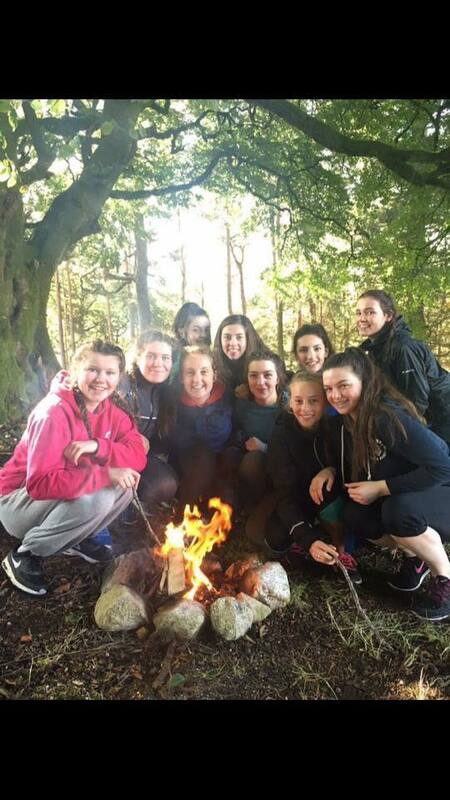 Are you starting to feel overwhelmed by all the activities so far in TY? Is it, feeling like a hurricane of committees, clubs, talks, sports, and trips already? And it’s only October?! We will be keeping you up to date on the latest and greatest parts of your Transition Year so you can be positive that you haven’t missed a single thing. 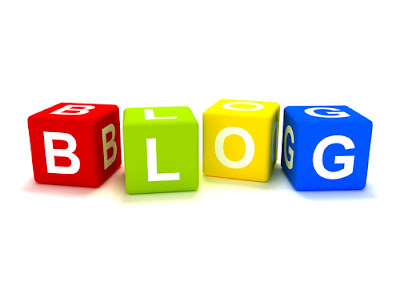 This year, the TY Blog Committee hope to post articles that students are both interested and involved in. 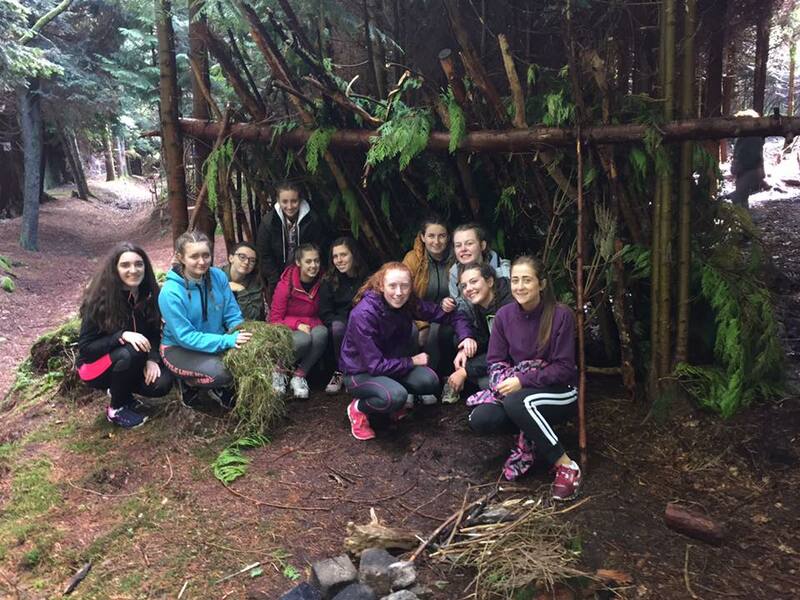 Here we will keep a diary of our Transition Year experience. We hope to have a collection of entries including articles, photographs and videos so that we can look back on all the memories we made together. Welcome to the TY Blog! From Erin, Tara, Megan, Karin, Emma-Jane, Naomi, Alice, Hannah, Aoife, Laura, Isabelle and Aisling.